In this section we have brought together advice, tips and current wedding trends to inspire and help you. Roses remain one of the most popular choices for weddings- they originated in China but are now grown in most parts of the world. There are 100s of different varieties and they come in most colours (except true black and blue/purple). 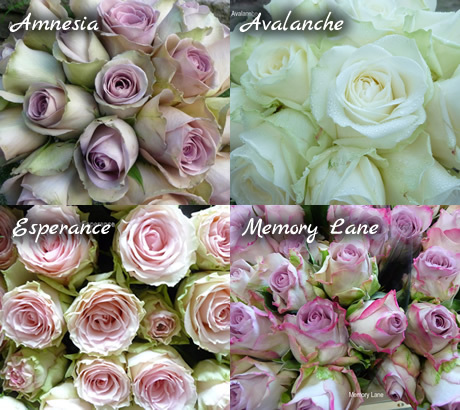 Some are scented like a lot of the garden varieties, particularly the David Austin ‘Patience’ ( buttermilk in colour) and ‘Keira’ (vintage pink) but also roses such as ‘Jacaranda’, ‘Sterling Silver,’ ‘Extase,’ ‘Ritz,’ ‘Norma Jean’ and the very popular ‘Margaret Merrill’ spray roses. ‘Cezanne’ – which is a bi-coloured cream and pink rose. ‘Carousel’ – large headed cream, green and deep pink edged rose. ‘Quick Sand’ – creamy beige. ‘Memory Lane’ – dusky pink with lavender hues. To obtain the vintage look, mix some of these roses with other English country blooms such as big blousy peonies (they come in lovely shades of pink, buttery cream and apricot), scented garden stocks, phlox, wax flowers or astrantia. Team them with herbs such as rosemary, sage, mint or alchemilla mollis foliage. Ask your florist for unstructured designs with a “just picked” from the garden look. ‘Red Naomi!’ – large flower head and lightly fragrant. ‘Black Magic’ – dark garnet red, strong stems. ‘Maroussia’ – medium/large flower heads ivory with a creamy centre. The shape and style of your bridal bouquet will generally be determined by your wedding dress, your body shape and your personal style. The trailing ‘shower’ bouquet – these tend to be the most expensive (because of the time, skill and amount of flowers needed.) They best suit a formal wedding and full/large skirted dress. They can be heavy to carry. Make sure your florist shows you how to hold this bouquet – important with all wedding bouquets, but especially with this type. The ‘teardrop’ bouquet is a neat and compact version of the shower bouquet and is a ‘teardrop’ shape (wide at the top, tapering to a point.) These will suit both an elaborate grand wedding dress as well as a more structured contemporary gown. The ‘over-arm’ or ‘freestyle’ bouquet tends to suit tall slender brides and modern sleek gowns. 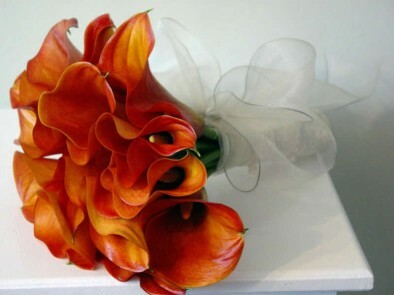 They work best with orchids, (phalaenopsis, vandas or cymbidiums) and callas lilies. They are simple, stylish and understated. If you have a detailed dress you may wish not to carry your bouquet in front on you – so this type would be a good option for you as it is held to the side of your body in the crook of your arm. 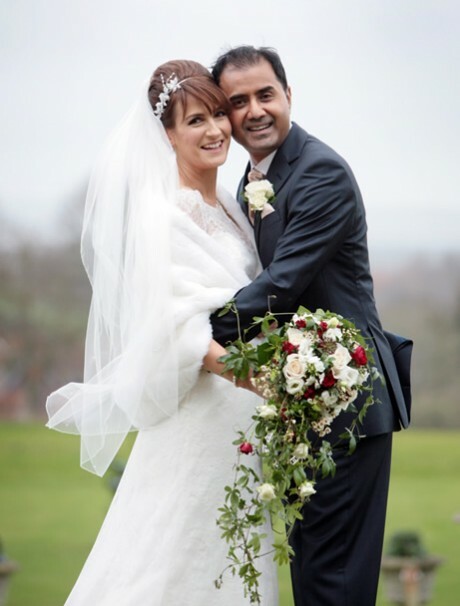 The ‘hand tied’ bouquet (a circular, domed posy) suits most dress styles and body types. 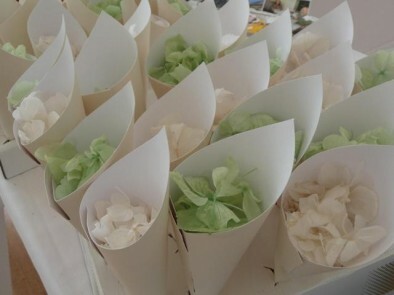 It is the most popular choice for brides, it photographs well (from all angles) and is easy to carry. Bouquets are made specifically for you; they can be made in different sizes. Any colours can be used in your bouquet, (though not all flowers are suitable for all bouquet styles) generally the colour of the bridesmaid dress is incorporated in your bouquet. Consider the time of year when you are getting married and where possible stick to seasonal flowers. Decide if fragrant flowers are important to you. Remember that there are no hard and fast rules and a good florist will be able to guide you and suggest ways of using your favourite flowers/colours and interpret your ideas. Don’t worry about white flowers on white dresses disappearing. The foliage will help your bouquet to be more visible against your dress without stealing the show. 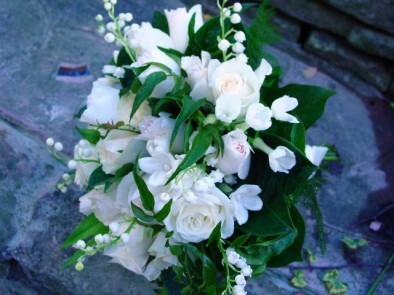 White flowers are always a classic and very stylish choice and will never look dated. 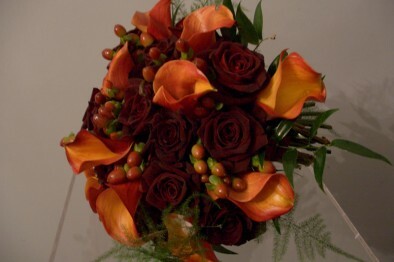 Decide if you want your flowers to look formal, informal, romantic or contemporary. Please see ‘the meaning of flowers’ also in this section. strings of rose petals threaded on coloured ribbon tied to chair backs or cascading form mantelpieces. Mocha coloured bridesmaids dresses, a very versatile and easy to wear colour, fits in well with a vintage look ,(£80 from www.bhs.co.uk ); Stunning with deep red (Grand Prix) roses. Three foot tall table candelabra decked with vintage roses, like ‘Old Dutch’ and ‘Metallina’ with hydrangeas and lots of trailing jasmine and ivy foliage, gives a very vintage look- £60. Use the same flowers in your bouquets, maybe adding pearls to complete the look. Where possible try and stay with seasonal flowers- better for the environment, more economical for you. And in the future you will always be reminded of the season and your wedding day when you come across your chosen blooms. Invite your dog! you can get a full floral collar made for him or just a few flowers on organza ribbon. From £10. Ask your florist to use light reflecting mirrors under your table flowers, this gives a more dramatic effect. Add accent colours to your reception tables by tying coloured organza or silk ribbon around your napkins or the tiers of your cake. A 10 metre reel of ribbon will do about 15 to 20 napkins. Decorate the top of your wedding cake with hand made chocolates. Use preserved or fresh rose petals as a top table runner. Mirrored vases- very contemporary, available from us to buy or hire. When booking a venue ask about ‘mid week packages’ you may get a better deal. If flowers are included in your hotel package consider upgrading them – speak to the florist, don’t just give your colours to the coordinator. If you have an allergy or are getting married abroad look into using preserved flowers instead of fresh, they look and feel just like the real thing and last indefinitely. Preserved bouquets from us are from £60.00, button holes from £4.50. contact us for more details.